I just LOVED this book. It did come out last year in hardback, but it’s brand new in paperback. 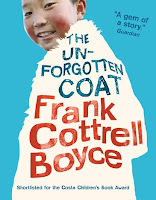 I am a Frank Cottrell Boyce fan, I loved Millions and I loved Framed, so I was excited to get my hands on this one. From a purely aesthetic book loving point of view this book has a textured feel to the cover, and has great Polaroid photos throughout, that are basically the reason this story is being told. This book just feels to me like someone is sitting down and telling me a story about their childhood. That sounds ridiculous, as all books are stories, so technically that is what all books should do, but not all books make me feel like that. When I reached the end of this book, and I read the inspiration behind it, it all became a little clearer. To me some books have a real soul, they are special, and I think that occurs when the story is about something that means something to the author, and that is how I feel about this one. 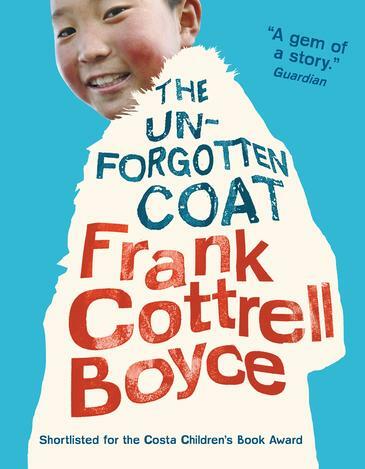 The story is told by an adult female who is remembering her last year at Primary School. It’s a Polaroid photo of herself, and three friends that has prompted her to tell the story, and this is just the first of many photographs that feature in the book. The photographs were taken by Chingis, and Julie’s story is intertwined with that of Chingis and his brother Nergui as we read about what it is like for the boys coming to a new country and being part of a new culture. There is also a feeling of foreboding, as Chingis and Nergui feel that they are being chased by a demon. The question is, is there really a demon, or is there something very real that the boys are afraid of? And in that moment, I felt my own ignorance spread suddenly out behind me like a pair of wings, and every single thing I didn't know was a feather on those wings. I could feel them tugging at the air, restless to be airborne.